The first thing that most people notice about Japanese mobiles is how people use them more as e-mail devices and mini-web browsers than actual phones. Mobile phone mail (携帯メール keitai meru, or simply meru) has been a staple of the Japanese phone market long before the advent of BlackBerries and iPhones. While having a mail address on your phone may seem like a silly novelty, it is actually petty handy for directly contacting people all over the world. In today’s installment of our mobile phone super-guide we'll look at Japanese mobile-phone mail. Users with PCs can email mobiles and vice-versa, hence the popularity. Mobile email popularity could also be attributed to the well above-average costs of phonecalls. So don’t count on your new-found friends to call you regularly for chit-chats. Almost every modern e-mail enabled phone comes with a full list of still and animated e-moji or emoticons, some of which are so cute that they will make your eyes bleed while others are just odd, like Softbank’s smiling poop. Even for relatively serious business e-mails, don’t be surprised to find your colleges inserting cute little simile faces and bowing man animations. Phones often have a whole suite of decoration, colorings, and animations preloaded in the phone to make your e-mails extra super sparkly. Even though you may be tempted to skip on the data-transfer part of your mobile phone plan, you may soon regret it when sending emails takes it's toll. When you sign up for a new contract, the staff will generally ask you to pick a unique mail name (although you can change this at will). Unlike phone numbers, you cannot carry e-mail addresses when switching companies. It is not unusual for Japanese people to chose very, very long email names complete with numbers letters and smiley faces. Luckily you can avoid having to type these out as most phones come with an infrared port called seki gaisen (赤外線) that allow for phones to exchange data at short ranges. Look for a little black oval and matching it up with your partner’s oval. Luckily, this process is universal amongst all providers. However, if you are too cool for the regular keitai crowd and have an iPhone or smart phone then you may find yourself having to type everything. As we touched on earlier, SMS never really caught on in Japan. 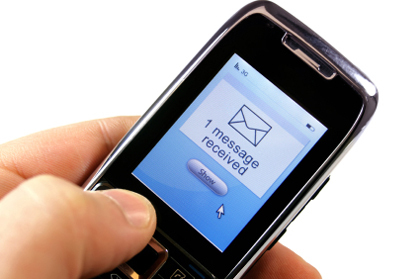 Although most phones are theoretically capable of it, free in-country SMS is often limited to within the same network. However, as of July, 2011, a new inter-network messaging system has been introduced allowing for cross carrier SMS. Keep in mind that these SMS messages are not free. Most mobile phone companies have deals with overseas providers that allows you to send SMS overseas and receive them although often this costs a significant amount (100 yen and up) per message sent and, in some cases, for messages received. Japanese phones are what are known as “always on” or constantly checking the local network for mails, service updates, and so on. So if you do go over seas, it is best to turn off your data roaming lest you want to find an unusually large bill upon your return. Also, be as cautious of spam as you would be anywhere else. Table of Japanese cellphone email addresses. Check back next week for our AccessJ feature on how to get multilingual phones in Japan. SMS between carriers in Japan is now allowed - just recently happened (this month) after an agreement was made between the main carriers in Japan. Funny you should mention that. I just got a mail from my provider today saying they flipped the switch on inter-carrier SMS. I will update this post to reflect that. Thank you so much for this post. Very informative and useful. Visit all 47 Prefectures in Japan... for free! WS: Eigo Noto 2: When is your birthday?